«The easiest homemade Pita Bread recipe! Simplicity is perfection, or just creamy Greek yoghurt drizzled with sweet rich honey and sprinkled with crispy walnuts and cinnamon! ‘Yiaourti me meli’ (Greek yogurt with honey) is a no-bake little treat suitable for every time of the day, as a delicious breakfast, snack or light dessert or simply as the perfect way to finish off that hearty meal! This bowl of goodness is so simple that you can barely call it a recipe. 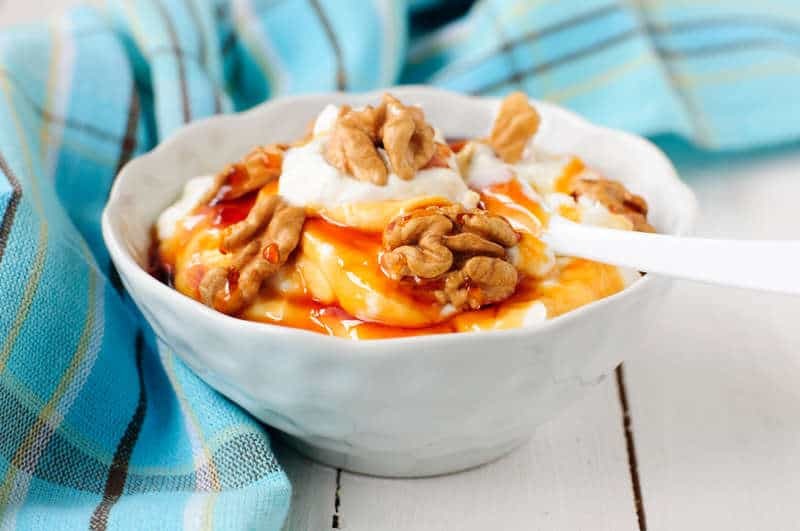 Putting together your Greek Yogurt with honey pot is amazingly quick and easy but also incredibly nutritious, as it combines three super healthy ingredients: Greek yogurt, walnuts and honey, which are rich in proteins, healthy omega-3 fats, vitamins, lactobacteria and many other nutrients. Greek yogurt with honey is commonly served as a healthy snack or refreshing dessert, perfect for when the weather is starting to warm up. To prepare this 2-minute Greek yogurt with honey dessert to perfection you need to pay attention to one little secret. The ingredients! Try to get your hands on some good quality, strained Greek yogurt, which is creamier, thicker and richer in flavour than other types of yogurt. Honey, being its key ingredient needs to be off good quality too, preferably organic, thyme honey – the less water content the honey has, the better its quality, so don’t be put off by honey that has already crystallised. That is only a good sign! Finally try to get your hands on the freshest walnuts you can find, as there is nothing worse than the bitter after-taste of old nuts, a sure recipe to ruin this delicious dessert. For a low fat version you can use low fat Greek yogurt, which still retains its creaminess and richness in flavour. If you fancy experimenting and have some extra time to spare, try toasting the walnuts for that extra nutty flavour and add just a tiny bit of vanilla extract to the yogurt for that delicious little twist! Enjoy! To prepare this delicious Greek Yogurt with Honey dessert start by toasting the walnuts. Preheat the oven to 180C. Spread the walnuts in a single layer on a baking sheet and toast for 7-8 minutes or until turning golden and fragrant. Transfer the toasted walnuts in a bowl, add the honey and blend to coat. Set aside to cool down for 1-2 minutes. In the meantime, stir together the Greek yogurt and vanilla extract and divide among 4-5 dessert bowls. Spoon the honey-walnut mixture over the yogurt and sprinkle with cinnamon powder. Serve immediately or store in the fridge. Enjoy! All these recipes look amazing and I will surely try my hand at many. But this delicious recipe calls for organic(?) honey. Who will prove honey is ever organic? The bees? I know an apiarist of repute who says one can never know if honey is organic.